Winter is the most unique season in Hokkaido, the amount of snow is unbelievable! 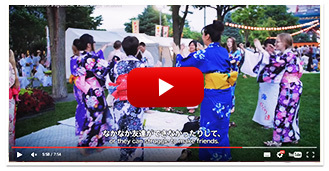 After 3 hours of Japanese study every morning we have prepared many different cultural experiences and winter activities for you to enjoy. Come and enjoy everything winter in Sapporo has to offer with classmates from all over the world! *Every Monday is admission day and every Friday is graduation day. Please see the pamphlet for more information. 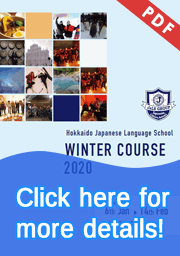 Winter Course pamphlet. Winter is a wonderful time to visit Sapporo. The streets are covered in mountains of beautiful snow, allowing for many exciting winter activities such as skiing, snowboarding, and snowshoeing, all within the city limits. After, enjoy a soak in one of the many famous hot springs. 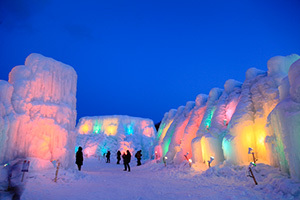 From February, the largest Snow Festival in Japan is held, The Sapporo Snow Festival. People from all around the world come to see the giant sculptures carved in snow, and enjoy the winter activities and food. Even in winter, you can conveniently get around the city via the underground subway system, so you won’t miss any of the winter excitement! For more information on Hokkaido please go to the About Hokkaido page.